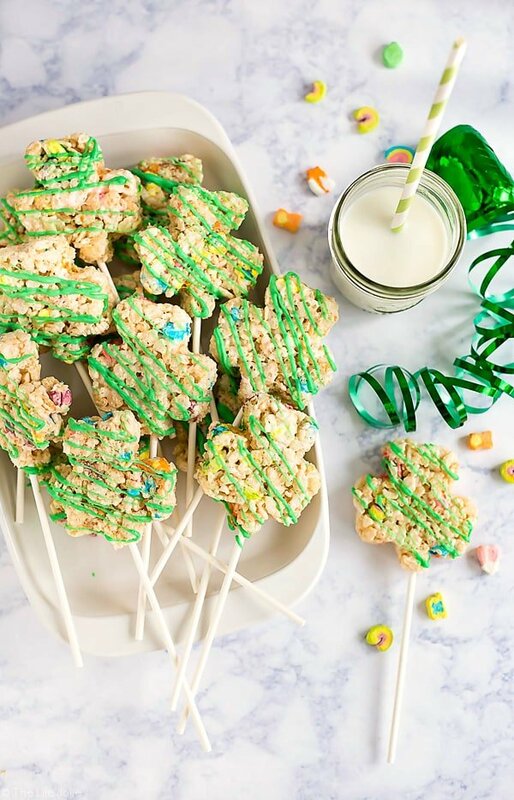 These Lucky Charms Treats are a super easy and fun dessert recipe to celebrate St. Patrick’s Day with the kids! 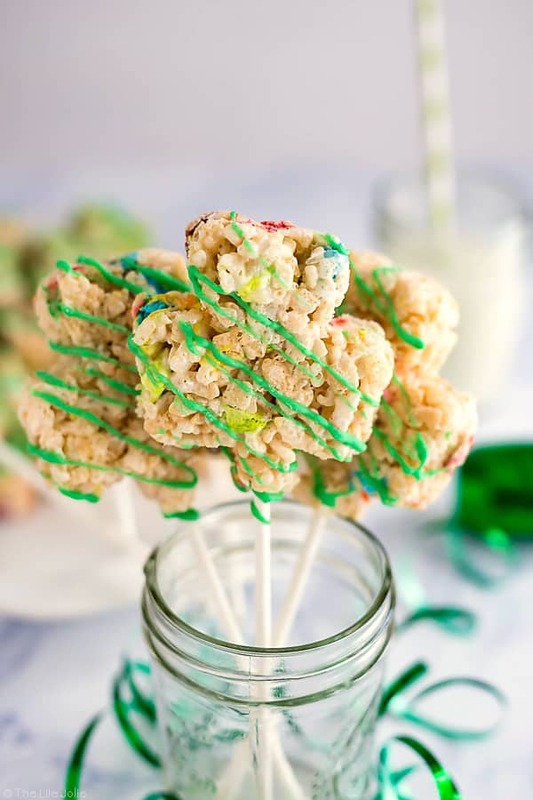 They’re made with Rice Krispies and the marshmallows from Lucky Charms and drizzled with white chocolate that’s been dyed green. 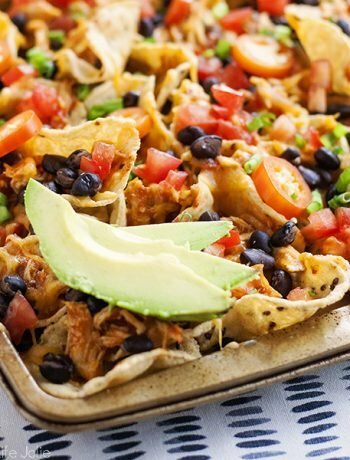 These snacks are such a fun option to bring to parties and get-togethers! There’s a little game we’ve been playing with the girls lately. We call it “The Electric Finger.” J (or I) will extend our index finger toward one of the girls. At that a point, they will extend their little index finger back. The moment that the tips of our fingers touch, J (or I) will go “Bzzzzzzzz” and act as though we’ve just received an electrical shock and the girls will immediately start cracking up. We’ve played it with A for a while, actually. But recently, T has started getting into it, so it’s a little thing we can all do together for a laugh. I can only imagine how much fun we’ll all have together as the girls get older! I just had to share that because it makes me smile. I think when it comes to holidays there are two kinds of people. The ones who decorate and go all out for each one and the people who enjoy it but don’t really do much. I definitely fall into the later category. Maybe there is a third category for people who hate holidays but I’m not counting them in this. I’ll put it to you this way. We finally got our Christmas lights up a week or two before Christmas and we just took them down this week. Yes. We’re those neighbors (sorry friendly neighborhood residents!). Also, when it comes to remembering to get special holiday outfits for the girls, I have around a 65% success rate. I don’t give myself too hard of a time, since the girls are so young they probably won’t even remember these things. But I aspire to be the kind of mom who gets into the minor holidays a bit more in the future. In the interest of this, and in an attempt to be more festive and keep things delicious, I decided to throw together some Lucky Charms Treats for Alice for all of us to enjoy. After all, my girls do have some Irish in their lineage from my husband’s side. 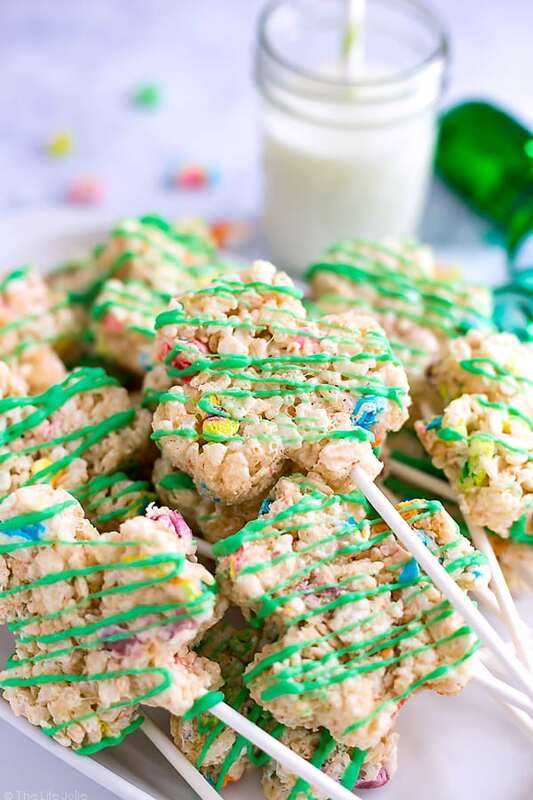 I initially tried making these using only Lucky Charms cereal, but we all agreed that the texture would be a lot more desirable if I used Rice Krispies and added the Marshmallows from the Lucky Charms (because isn’t that the part we all pick out to enjoy anyway? They were also much easier to cut out using Rice Krispies. The great thing is, I’m told you can buy the marshmallows on their own vs. having to pick through a box. 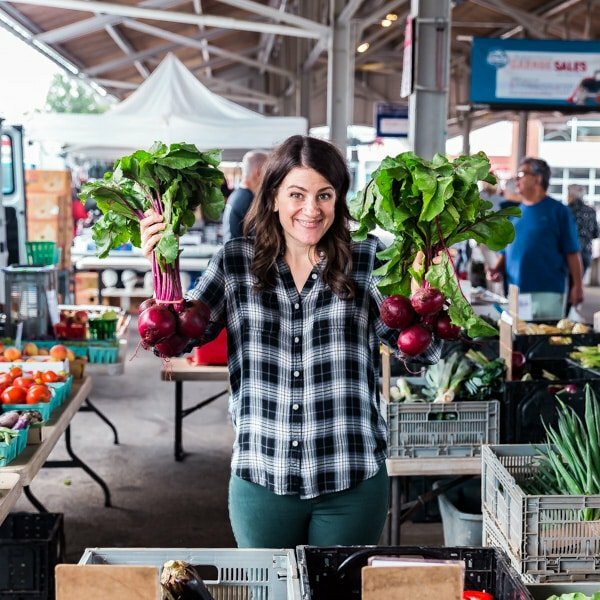 You’ll also want to have some sucker sticks and wax paper on hand! This is the cookie cutter I used. These are super simple to make and totally delicious. Though, I’ve never been a huge cereal fan, I have fond childhood memories involving those darn marshmallows. I enjoy snacking on it without any milk at all. 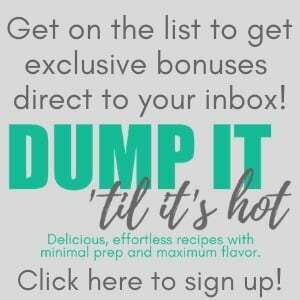 So these treats are a natural next step for me! Needless to say, A is a total fan. And so is J. If I was allowed to bring food to our daycare center, I’d totally bring these for the other kids too. But since that’s not an option at ours, my coworkers have graciously offered their assistance in eating up whatever treat I whip up. Thanks guys! 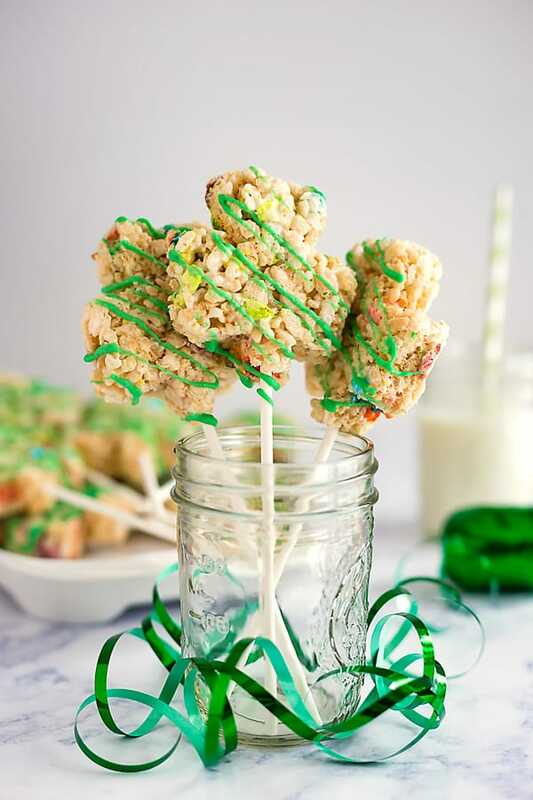 These Lucky Charms Treats are a super easy and fun dessert recipe to celebrate St. Patrick's Day with the kids! 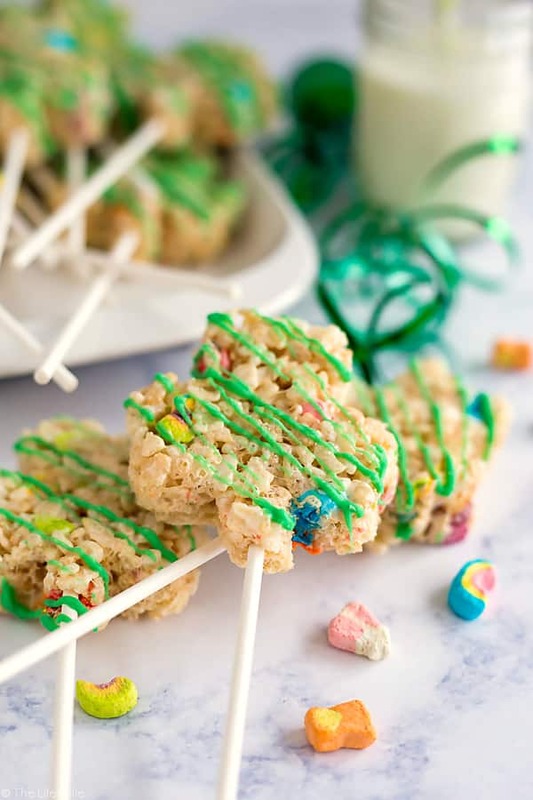 They're made with Rice Krispies and the marshmallows from Lucky Charms and drizzled with white chocolate that's been dyed green. These snacks are such a fun option to bring to parties and get-togethers! Melt the butter over medium-low heat. While this melts, grease a 9 x 13 pan. Place a piece of wax paper across the pan and press it down so that it sticks to the pan with the sides are sticking out of the pan (this will make it easier to remove the treat in one piece later). Spray a spoon with cooking spray. Add the marshmallows to the pot and stir them often until they're melted. Combine the Lucky Charms Marshmallows and Rice Krispies and add to the pot. Remove it from the heat and stir everything until well combined. Press down the mixture to cover the inside of the 9 x 13 pan and place a piece of wax paper across the top. Weigh it down with another pan for at least an hour to set. Once it's set, remove the Rice Krispie treat from the pan. Use a cookie cutter to cut the treats into Shamrock shapes and place the sucker stick into the bottom of them, and then place them around the edges of a wax paper-lined pan. You can also take all the scraps and shape them in the cookie cutter to make additional shamrocks so that they don't go to waste (or eat them!). Melt the white chocolate chips in the microwave in increments of 20 seconds, 20 seconds and then 10 seconds stirring in between and repeating until the chocolate is fully melted (this can also be done on the stove in a double boiler, but make sure to use low heat so the chocolate doesn't seize). Once it's melted add some green food coloring. Note: I found that this caused my chocolate to thicken and if that happens to you stir in a little canola oil, 1 tsp. at a time, until it thins out enough to be easy to drizzle. If it's too thick, it won't drizzle well. Drizzle chocolate over the treats on the diagonal and refrigerate for 20 minutes to let the chocolate set. 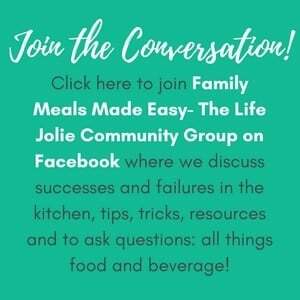 Don’t forget to follow The Life Jolie on Pinterest. February 28, 2017 at 11:40 pm My niece is going to be loving me when I show up with these for St Patricks day! She loves both Rice Krispie treats and lucky charms.... she's going to be one happy kid! March 1, 2017 at 1:51 pm I hope she loves them!! March 6, 2017 at 7:32 am These are adorable! My friend is having a little St. Patrick's Day gathering for her daughter's friends; I'm going to send her this recipe. Also, how did I not know that you could buy Lucky Charms marshmallows separately? My inner 80's child is in heaven! March 8, 2017 at 8:27 am Thank you! How fun to have a St. Paddy's day party- this makes me excited for when my kids get older! When I heard about the ability to purchase marshmallows only, I got super excited! March 6, 2017 at 9:43 am My boys will love these! What a fun idea to celebrate St. Patrick's day! What a yummy combo! March 6, 2017 at 10:55 am Haha I am totally the same as you - we love all the Holidays but I always forget to do something/decorate and I am fine with that :) I have been in the US for three years now and still haven't tried lucky charms!! These are super cute and I am sure the kids would be super excited to celebrate St Patricks Day with these! March 8, 2017 at 8:26 am While I don't personally eat Lucky Charms for breakfast (I don't eat many sweet things in the morning) I think they make a tasty snack or dessert! March 6, 2017 at 3:52 pm I didn't start decorating for Christmas until later on too. 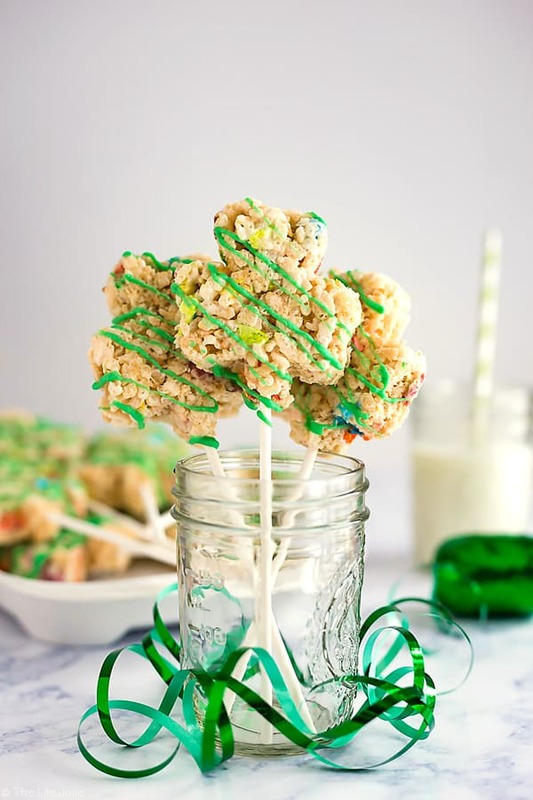 But this adorable treat idea for St. Patrick's Day could not be more festive! Such a cute idea to use the Lucky Charms and the cookie cutter shape makes it so so adorable! March 8, 2017 at 8:25 am Thank you! You're a gal after my own heart when it comes to decorating!